I believe that any piece of art, media, entertainment, etc should be up for critique. This is why I enjoy such web series as Nostalgia Critic; Doug Walker analyzes pieces of childhood sentiment and asks if it was really that good. Like many anime fans growing up in the 90s, Sailor Moon was my first real fandom. I tried with Disney and Animaniacs, but nothing has made a huge impact on my life as Sailor Moon has. I had to grab my hands on anything Sailor Moon related; by junior high, I had a Sailor Moon book bag that stuck out like sore thumb in a sea of Jansport backpacks! 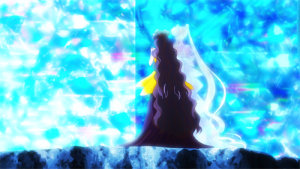 Sailor Moon Crystal is in it’s mid-season currently. It’s been the most anticipated anime to come out in a while. When news broke two years ago that a new Sailor Moon series was going to happen, the galaxy cauldron broke loose. We saw a rise of Sailor Moon cosplayers at cons and merchandise all around the dealers hall. We were getting pumped for this series. We even remember when the release date would be pushed further. We all went insane anytime that piece of news broke. 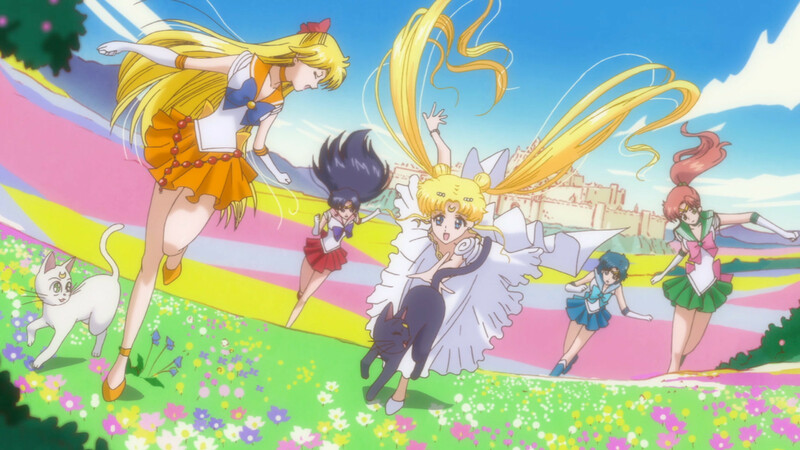 However, did Sailor Moon Crystal live up to the hype? One can compare this madness to the Star Wars Episode I: The Phantom Menace; a loyal fandom so hyped up that they believe that nothing could go wrong in the hands of the original creator. While mixed opinions vary from Moonie to Moonie on Sailor Moon Crystal, consider this my critique on why Sailor Moon Crystal just fails to deliver. Even watching both dub and original renditions of “Bishoujo Senshi Sailor Moon,” as much as I laughed and cried, it’s inherently flawed. Filler episodes didn’t bother me because at least you got to see Usagi and the girls behave like teenagers and go on adventures. It made the characters more human and relateable when you put them in mundane situations. I do agree that the anime’s biggest weakness was dealing with Usagi and Mamoru (PGSM fixes this!). There were episodes that did not need to be there (ie: Chibiusa and dinosaur island), and SuperS did kind of drag out the monster of the day formula (though we do get some nice character moments). While other seasons had Monster of the Day filler episodes, at least there was an overarching story and a subplot going on. 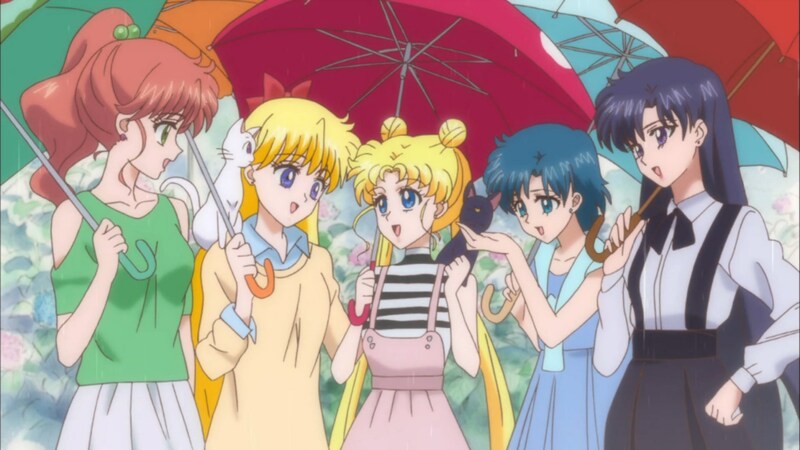 Say what you want to say about the rainbow crystal arc, at least we got to see development between characters and peaks into Usagi and Mamoru’s past. While Crystal allegedly follows the manga act by act, it doesn’t give us much room to breath and “be” with the characters. While defenders of Crystal say they don’t have time for 200 episodes, there are cheat sheets out there that can give you what episodes you need to watch, but even so, subplots such as Naru x Nephrite really did define Usagi as a loyal friend and complexities of their friendship. Naru and Usagi hardly speak in Crystal. Even PGSM and the musicals take place in their own universe, but with PGSM especially, you really know who these characters are. Each interpretation of Sailor Moon gives us another angle of the story and its beloved characters. 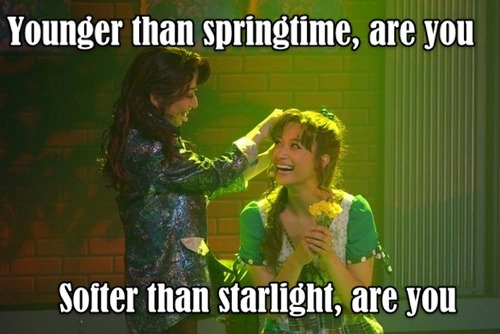 Rei and Minako are definitely different from their 90s anime counterparts in PGSM! Anime and manga are two different mediums. While both are visual mediums, both can stand alone to tell a story. Anime gives us the story in motion and even some leeway to introduce new situations and give us more insight where the manga did not. Jojo’s Bizarre Adventures and Attack on Titan were animes based on manga; they anime followed the printed counter parts faithfully, but also added in extras that did not detract from the overall story. Shorter manga runs like Angelic Layer were given 26 episodes to delve further into the world of Barbie Bloodsport. It is also important to note that Naoko Takeuchi’s original manga is very, very flawed. I remember reading when the Tokyopop translations came out when I was in 10th grade. I was enamored by the world and pretty drawings; it was my first time reading a heroine comic. Reading the manga again after graduate school, I came to realize that outside of the short stories, the senshi are hardly given any development and it just seems to heavily focus on Usagi and Chibiusa. By the time we get to the Stars arc, the inners and outers have very limited dialogue. Even when certain characters kick the bucket, we are not given much time to really grieve the passing. Despite the flaws, the manga does have strong points. I like that Stars is an epic battle across the galaxy – I want to see that animated! I do believe that if you’re going to introduce a piece of art from the early 90s, you can still fix up those flaws for 2015. This gives a second shot to have that creative control and make the fans happy. As mentioned in the previous section, having a new Sailor Moon for the mid-2010s would have been a nice update to the multiverse, but I can’t really think of anything bland to compare it too. 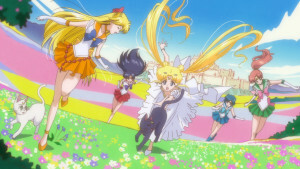 Yes, it does look pretty, but it lacks in contribution to the Sailor Moon multiverse. It feels more of the same; lots of style, less substance. As mentioned previously, even with filler episodes, at least you got some insight to the character that the series was focusing on. The main problem with Crystal is not the animation (it’s being fixed for the BluRay release), but cramming the Dark Kingdom arc in 13 episodes. While the intention was to follow the arc chapter per chapter, you could have easily made a smoother series in 26 episodes. Even so, Crystal somewhat deviates from the source material. The generals last longer, but only to exist for the senshi to confront their past lives with. Yeah, it might have taken longer to get to Chibimoon, but I felt there was a lot missed opportunity and talent along the way. We had wasted talent like Ami Koshimizu voicing Jupiter and only given limited dialogue outside of Makoto’s focus episode. For example, take Queen Beryl’s story arc. 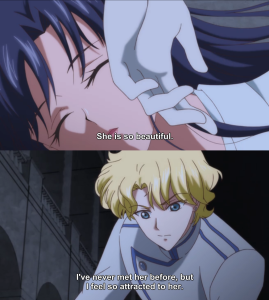 In the manga, she was in love with Endymion. Like any romantic tragedy, her feelings were not returned. She goes evil and you know the rest. We only get five seconds of Beryl looking forlornly at Endymion and Serenity from afar. I really wanted to see this story expanded. Fans I’ve spoken to say, “Well at least we got to see it.” I thought it was a wasted opportunity. How awesome would have it been to see a story arc where we see the past lives of these characters. Beryl was not always wicked, she was moreso seduced by the dark side. We do see this character arc hinted out a few points in flashbacks to the Moon Kingdom, but it’s never really expanded upon. 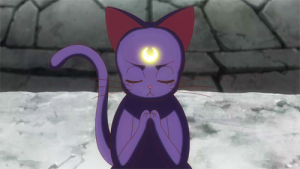 The great thing about Sailor Moon as a character is that she sees the good in others, no matter how evil they may be. The original 90s series strength was it knew when to be comedic and lighthearted and it knew when to be dark. Part of Crystal’s praise is that it’s not afraid to be dark. However, it still feels pretty fluffy and airy when you compare it to how the 90s series played it out. 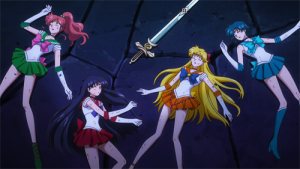 The inner senshi had some serious brutal deaths at the Beryl arc. “But Toei Animation wanted to end it there!” Even if Toei’s original intention was to kill off the cast, it’s still very dark in retrospect. Sailor Moon S’ story focuses on an Anti-Christ like figure in the shadows. The very last story arc is not afraid to disturb or shock you either. Sailor Moon Crystal doesn’t really make much of it’s time. 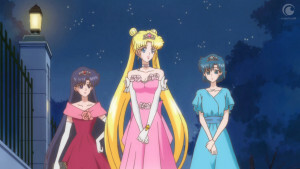 While the alien arc of “Bishoujo Senshi Sailor Moon” could tell a story in less than 15 episodes (and giving each character some insightful moments), Crystal crams and rushes leaving us something half baked. Sure it looks pretty, but it’s more style and less substance. Sailor Moon Crystal, while a shorter series and attempts a whirlwind version of the Dark Kingdom story arc, the pacing is way too fast even for a 13 episode series. It gives us a lack of time to appreciate the supporting cast and how they play a role in the main heroine’s life. 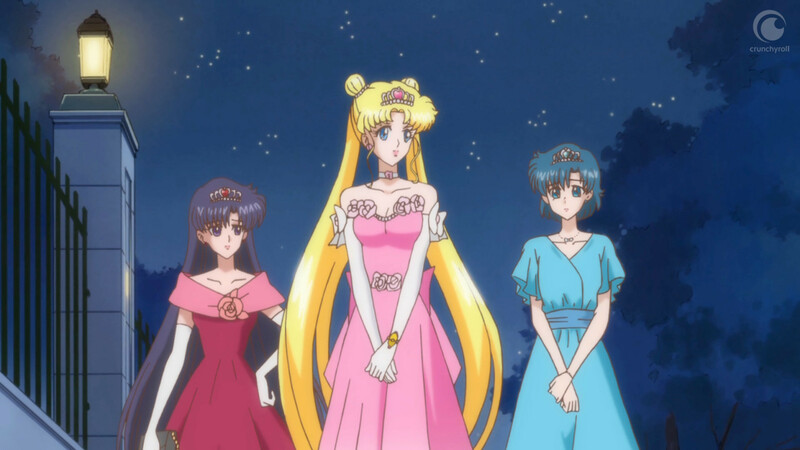 At Otakon 2014, I asked the Canadian dub actors on what makes Sailor Moon a series all about girl power. Katie Griffin (Sailor Mars) said, “…you have five scouts with different personalities, and we’re all kind of awesome and having each other’s backs and having that dynamic of friendship and loyalty, all these strong characteristics that everyone could relate to: girls, guys, everybody could relate to the different personalities.” (source). 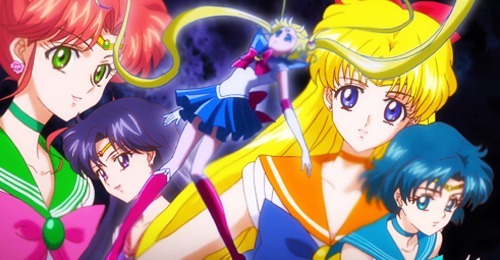 While Sailor Moon Crystal has individual focus episodes of the senshi, beyond that, we really don’t much about them. I did like Mako’s backstory where we do get to see the senpai that put her in the friendzone, but the inners are more reactionary to Usagi / Sailor Moon than having their own agency. While Sailor Venus does stand up for the girls from time to time, that’s all we get from her. 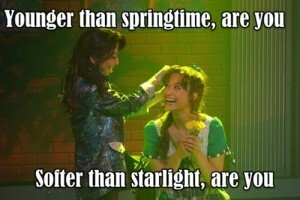 At least in PGSM, Minako was a tough cookie, but she did have a side she didn’t want to show. Even PGSM Rei tries to snap her out of it. If anything, the senshi acts as a Greek Chorus to Sailor Moon. They are more reactionary to the happenings around Usagi than anything else. My other beef with how the inners are portrayed. While the fighting styles is reminiscent of the Pretty Cure series; very few stock attacks and lots of hand to hand combat, the senshi are not as powerful. Part of the joy of the franchise is rooting for your favorite sailor senshi. I’d like to believe that these girls are fighters, but it’s really tragic when you see your favorite on the ground for most of the series. 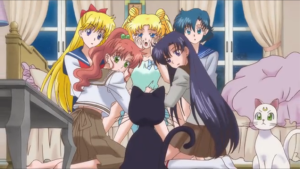 Even in the 90s series during the first season finale, the senshi wouldn’t go down without a fight. Each senshi had their swan song when they met with the youma in the freezing cold. 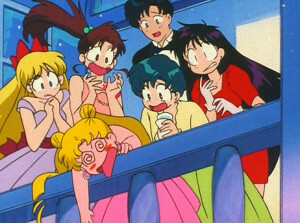 Not only they gave their own lives, but Usagi reacting to their deaths was traumatizing. It’s amazing that she still had the strength to go head to head with Queen Beryl. It’s just disappointing when you have a girl power song like “Moon Pride” and you see the team down for most of the time. They shine in their character intro eps, but don’t expect much after that. 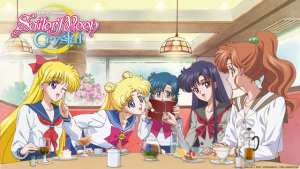 The manga devoted more time to really differentiate the senshi from one another, even if it was reacting differently to Usagi’s lighthearted and sillyness. Even in five panels, we see more personality. (However, as mentioned above, later on in the manga run, their lines are limited to their power ups and finishing each other’s sentences.) The short stories helped flesh out the girls more. A few fans would also argue that the manga and “Bishoujo Senshi Sailor Moon” are supplemental. Both stories were in development at the same time; the anime had “filler” as it was “waiting” for new story developments in the manga. You already knew the senshi from watching the anime and then diving into the manga (and vice versa). 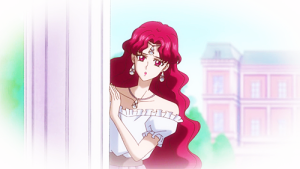 However, can Sailor Moon Crystal be as standalone as PGSM and the musical series? A Tribute to the Fans or a Gateway for New Moonies? Anime has had a series of remakes through the years. In 2014 we’ve seen remakes of the Fate series (Fate/Stay Unlimited Bladeworks) and the newer Jojo’s Bizarre Adventure series. The latter does follow the original manga, but it’s not afraid to add in a few new things without detracting from the characters. Crystal’s biggest weakness is that Usagi is very “dicks before chicks.” One can argue that the manga had the couple sexually active, but Usagi would not ignore her friends when they are fallen on the ground. Even in the 90s anime, she didn’t believe that kissing Tux would bring him back to life. Crystal isn’t quite a primer for the casual fan. However, I can introduce Brotherhood, Unlimited Bladwords, St. Seiya Omega, and the new Jojo’s Bizarre Adventures to new fans and they can completely get it. I have a hunch that Crystal was mostly for the audience who grew up with it, but I have seen a sea of new fans who don’t have to have anything to do with “Bishoujo Senshi Sailor Moon” and just want a quick ride through the series. Anime back in the 80s and 90s weren’t clear cut 26 or 13 episodes. On average, you got about 50 or so episodes per series. If it was good, you stuck with it. You made time to stick through the adventure. It’s kinda insulting since Viz has now decided to release “Bishoujo Senshi Sailor Moon” to be enjoyed uncut and unedited when people just want to out right ignore it’s existence. Additionally, no one likes seeing infighting in a fandom, especially if it’s a fandom you treasure. I used to enjoy going through the Sailor Moon tag on tumblr. I don’t mind a debate and reasoning why one adaptation is better than the other; it’s just a matter of opinion (like this editorial piece). However, I’ve seen Moonies take it too far. 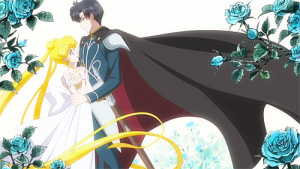 Anime News Network had a regular review Sailor Moon Crystal episode per episode providing recaps. I agreed and disagreed in some areas, but the writer was simply doing their job. In one particular Moonie Facebook group, he took his anger personal. He went to the ANN boards and threatened to have this writer fired. Gatekeeping and determining if someone is a “true fan” of the Sailor Moon multiverse based on their opinions of Crystal is just as wrong as labeling “fake geek girls.” Our sailor suited heroine would not stand for this nonsense. We are free to have our own thoughts and draw our own conclusions as to what Sailor Moon Crystal is. As any entertainment medium, it should be open to criticism. Probably my biggest takeaway from “Bishoujo Senshi Sailor Moon” and “Pretty Guardian Sailor Moon” was Usagi’s loyalty to others. Sure she may not get the best grades, but she has this loyalty that is often hard to find. Even when you go through 200 episodes, think of all the people she’s helping in each of the Monster of the Day episodes. Her heart is always in the right place; she saves people, she does not kill people. It all comes down together nicely when you have that dramatic season finale because you have seen her care for those different than her. In PGSM, she wants to bring out the best in people – she’s friends with people who would not be together otherwise. However, there is the complexity of seeing Mamo-chan on the side. Sailor Moon may not be the greatest anime of all time, but it still stands a pop culture icon, even outside of Otakudom. I meet people at comic cons who are only aware of the Canandian dub and have never seen an episode of the original (but I tell them to check it out on Hulu). I don’t think the Sailor Moon in Sailor Moon Crystal can roll with her heroine peers of 2015 – Kamala Khan, Emma Swan, Peggy Carter, Ryuko Matoi – etc. I can say the Sailor Moon of the 90s (and even PGSM Sailor Moon) can still hold up to this day. Will I be watching Crystal? I will continue to keep an open mind and hope that it gets better from here. The Dark Kingdom arc has always been the weaker story arcs of the manga. Yet, I hope with such a dramatic swan song like the Stars arc, it is not rushed like a JK Rowling death scene.